This account of the Prophetess Elizabeth Gray (sometimes "Grey") is taken from a pamphet of 1707 by Richard Kingston, a vituperative and well-informed opponent of the French Prophets. In this instance Kingston quotes from Letters he claims to have received from a "Mr. L. M." and a "Mr W. C". both of whom were be present at meetings in which Elizabeth Gray played a conspicuous part. Despite the hostile bias, the parallel between Betty Gray and later Jansenist Convulsionnaires is clear. Both Betty and her companion Anne Watts, "Pudding-pie Moll", a shop maid to a pastry-cook, were young girls from comparatively humble social backgrounds, readily suspected of opportunism and imposture. They introduced a new element of figurative enactment into the repertoire of the French Prophets, along very similar lines to the Jansenist tableaux. (In Kingston's second letter Betty impersonates the "Whore of Babylon") Whether deliberately or subconsciously, there was also an evident sexual undercurrent to their performance - and, it seems, to their relations with some of the male adherents. It was about this time, that the precious piece of Mortality, Betty Grey, who makes such a Figure in this Narration, came, and almost without Calling, to add to the Number of the Inspired, and has proved so great a Proficient in the Art and Mystery of Prophesying, and Feats of Activity, as to outdo all the rest. Of her Parents and Education I have no Knowledge, all the Account I have of her is, that she is the Man's Niece that snuffs the Candles at the Play-House, and there in all Probability she learn'd the gamesome Frolicks she "practised among the pretended Prophets; with whom she came acquainted, by the French Prophets lodging at her Uncle's Home about a Fortnight, and all of a sudden, grew very intimate and familiar with them. It seems, she was a wild skittish Girl, and Mr. Marion rebuked her for her light and wanton Behaviour, which had such an Effect upon her, that she took it to Heart, and wept bitterly, and ever after shed Tears when he spoke to her, tho' Betty understood no French, and Marion could speak no English. However, after this she became more Serious; and one of them having an Inspiration while they lodged there, and declaring, that one of that Family was to be called out for the Work and Service of the Lord, Betty Grey was soon seized with the Symptons of Inspiration, and in a little time after her Mouth was opened. Not long after, says my Friend, Mr. L. M., Betty did all things by Inspiration: Left her Aunt's House sometimes two or three Days and Nights together. After that ten or twelve Days and Nights successively, and at last, told her poor deluded Uncle and Aunt, that she must leave them for good and all; for she had received a new Name from Heaven, viz. Saraiah the Mother of the Faithful, and therefore must live among the Prophets, and work in the Lord's Vineyard. This her Aunt told me. When Betty Grey left her Uncle and Aunt, she told they must expect to hear no more from her till she was in Prison; but that proved notoriously false. She also told me that Mr. Lacy and the other Prophets longed more for a Prison than for Meat and Drink; for then the Judgments they had foretold would certainly come to pass. Their last Meeting on June 28 1707, consisted of about thirty Persons; where Mr. Allut a French Proselyte had the first Inspiration, and after other Words, his Spirit declared, that Betty Grey should have a Vision of Angels. She took the Hint, and before Allut had quite done, fell into an Extasy, and pretended she had such a Vision, but refused to tell the Particulars publickly. Though another of the Inspired too an opportunity to say, that her Vision was a Confirmation of Mr.Allut's Inspiration; though there was no other Proof of her Vision than her bare Affirmation, and every one knew their Cue so perfectly, that I and several others that were present, were really of Opinion, it was concerted between them before they came from home, for they cohabit in the same House. Thus Sir, all that they would have look strange, and like Truth is acted upon and among themselves, who being under the same Delusion, will not not discover their own Cheats. When I thought the Show was at an end, Allut, who stood by me near the Door, fell into such a dreadful Fit, as frightened a Gentleman that came with me. He fell upon his Back, afterwards turn'd upon his Face, and as they said, prayed incomparably. Then Allut and Betty Grey made a shew of departing, but when they had gone down two or three Steps, an Inspiration seized Betty, upon which she returned and had such a dreadful Fit, that sitting down in a Chair, she made the very Room shake. In short, Sir, she had a huge Hamper full of Blessings to bestow, one of which I believe was designed for me, if I had not made the best of my way to prevent it. They continued in giving their Blessings till ten a Clock. I might also acquaint you Sir, with the Gentleman's Reflexions upon Betty Grey's immodest Actions, but 'tis too smutty for chaste Ears; for in truth, all her Agitations are attended with such shameful baudy Sight, that none in their Senses, can believe them to be Acts of Religious Worship, as they pretend they are. Betty Grey's thriving so well in this Trade, and living in such great Plenty and Esteem among the chiefest of the Inspired, soon brought in another she Sinner among them, to be translated into a Prophetess...Pudding Pye Moll, I cannot yet learn her Sirname, but she is generally known in London by that, beause she lived by carrying and selling Pudding Pies about the Streets; not that I despise any Person that uses the meanest Employment to procure an honest Livelyhood; but since I know no other Name, must be excused for calling her by this. She was sometime under the Tuition of Betty Grey, and had only the Preparations, but not the Gift of Prophecy, till a while after, and then her Tutoress, in a solemn Meeting gave her her Blessing, open'd her Mouth, adopted her a Sister, and promised her the Gift of working Miracles. And this is all I shall say of this Woman at present, unless she comes in my way at another Meeting. ."
"Thus Sir I have given you a short Account of part of what I was an Eye-witness, in the hopes it may contribute something to the detecting of those vile Persons...since I can truly, and without Prujudice say, that I never saw any thing among the, but what appear'd to me to be premeditated Knavery. There are several versions of this print. B. Benjamin, Jackson, Writing what they all say. D. Sir Richard Buckley, to be made straight by the Power of the Prophets in 6 Months. E. Mister Dutton the Lawyer. F. Mr. Lacy shaking his Head. GG. Converts not yet come to the full Spirit of Prophecy. I. A little Boy being about 10 Years of age being distrub'd, fell a Cursing the People, and threw himself on the ground upon his Belly. K. A young female Prophet of Seven Years of Age. L. Mrs Betty Gray, sitting at a Table with a Dove, which flew upon her Shoulder; she is termed among the Prophets an Angel of Light. At a meeting at Sir Richard Bulkeley's chamber, in Great Russel-street, where were present Mr. Lacy, Mr. Allut, Mr. Facio, Mr. Marion, Mr. Cavalier, and almost the whole Room full of other People; Betty Grey, under violent agitations, personated the great Whore of Antichrist. Took all the Chairs in the Room and barricaded the Door, that no body might come in or go out. This done, she laid aside her Manteau and Night-clothes, tyed up her Hair before all the Company with singular Modesty ; then taking a Peruke and Hat that she found in the Room, put them on her Head, and sat down in an Elbow Chair very Majestically, with her Arms a Kembo. 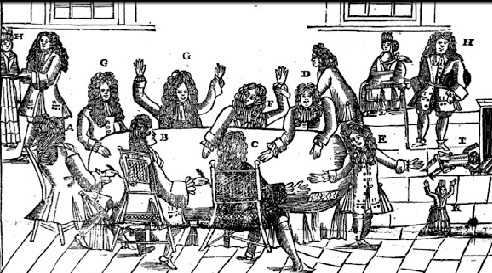 After this, she rose out of the Chair, and for about an hour together thump'd and beat with her Fist every one in the Room in their Turns, except Mr. Lacy; Sir Richard Bulkeley hid himself a while in a Corner of the Room, in hopes to avoid the Effects of her Fury; but she, finding him out, laid upon him unmercifully, without any regard to his diminutive infirm Corps, or his Quality; insomuch that he found himself oblig'd to make his escape over the Bed, to shelter himself from the hard Blows of this Termagant Whore of Antichrist; who, as soon as the Skirmish was over, sat down again in the Elbow Chair; and, being still in an Extacy, open'd her Mouth, and fell a Ranting at a rate agreeable to her own Character, and the Whore she represented. Then Mr. Allut, falling into Agitations, and being commanded by his Spirit to combat this Female Fury, cries out, es tu la Grande Bête, la Putain de Babylon? Art thou the great Beast the Whore of Babylon? Then rose up, pull'd her down upon the Floor, stamp'd upon her, kicked her about as if she had been a dead Cat, and, walking in Triumph on her Body, stood upon her Breast till she appear'd Lifeless. Then to try whether she was living or dead, Mr. Allut alternatively lifted up her Legs and Arms, which fell down again upon the Floor, like the Limbs of a dead Body. Immediately after, she rose up, spoke,and gave Thanks, that Antichrist and the Whore of Babylon were overcome. upon which, both their Inspirations ceas'd; and both the Actors declar'd they had no Sense or Remembrance of what had pass'd in this Renconter; though they made such a horrid Noise in the House, that Sir Richard's landlady gave him Warning to be gone. Of this whole Scuffle, Sir, I was an Eye witness, and in no small Pain when I received my Share of the Blows, which the Whore of Babylon with a liberal Fist bestowed upon me. Betty Grey also acted this Tragi-Comedy at another time, at Mr Facio's Chamber, over against the Rose Tavern in Covent-Garden, in all its Circumstances, except Barricadoing up the Doors with Chairs. Another Time I have seen my Sister [the Prophetess Mary Keimer], who is a lusty young Woman, fling another Prophetess upon the Floor, and under Agitations, tread upon her Breast, Belly, Legs,etc, walking several Times backwards and forwards over her, and stamping upon her with Violence. This was adjudg'd to be a Sign of the Fall of the Whore of Babylon.